More Washes ? 5 extra uses compared to our 25 wash bottle. 74% less plastic than our 25 wash bottle. Brilliant stain removal, even in a quick wash. Works efficiently at lower temperatures. Apply for your free stain remover dosing ball at Persil.com. 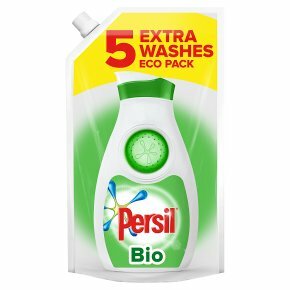 Powder, capsules, and tablets are also available in the Persil bio range.What does it do? Tackling tough stains can be a challenge, but with Persil Bio Liquid Detergent stain removal is simple. It offers effective stain removal even in a quick wash, making it the perfect laundry detergent for any busy routine. Plus, with our specially designed Eco Pack that uses 74% less plastic, you can help us reduce waste. Persil Small and Mighty Bio?s improved biological formula contains enzymes that break down stains even in a 30°C wash. It provides great stain removal for common stains such as grease, pasta sauce and orange juice. How do I use it? Use the Eco Pack to either refill your old bottles, or store in the pack and pour straight into the dosing ball when you need it. If you can?t find your dosing ball, you can order a new one free from www.persil.co.uk. Simply pour the washing liquid into the ball then place the filled ball on top of the clothes in the washing machine drum. Don?t use this washing liquid with silk, wool or any delicate fabrics. To pre-treat stains with the Stain Eraser Ball, use this three-step technique: pop the Stain Eraser Ball out of the middle of the bottle, pour a small amount of neat liquid detergent into the ball and apply directly to the stain, then rub the area gently with the base of the Stain Eraser Ball to help loosen the stain. After pre-treatment, place the garment in the washing machine with the recommended dosage of Persil small & mighty. Warning: causes serious eye irritation. Causes skin irritation. Harmful to aquatic life with long lasting effects. Contains benzothiazolinone. May produce an allergic reaction<br>Keep out of reach of children. If on skin: Wash with plenty of water. If skin irritation occurs: Get medical advice/attention. If in eyes: Rinse cautiously with water for several minutes. Remove contact lenses, if present and easy to do. Continue rinsing. If eye irritation persists: Get medical advice/attention. Avoid release to the environment. Dispose of contents/container in accordance to national regulations<br>As we are always looking to improve our products, our formulations change from time to time, so please always check the product packaging before use.